Siberian carrier Alrosa, owned by the homonymous diamond-mining company, has made plans to acquire two Boeing 737-700s, as part of its fleet expansion program for 2017 and 2018. Earlier the Mirny, Yakutia-based airline was considering Sukhoi Superjet 100 (SSJ 100), but the final decision was not in favor of the Russian-made aircraft. Alrosa posted a request for quotes on Boeing 737-300s, 737-500s and 737-700s in the fall of 2016. But at the end of the tender period the only proposal it received was from BOC Aviation leasing company. The Chinese-origin lessor offered two Boeing 737-700s, which are currently operated by Canadian low-cost carrier WestJet Airlines. So the tender committee decided to announce BOC Aviation the winner. The lessor claims it will deliver the first aircraft (s.n. 37088, built in 2009) in November 2017. The second aircraft (s.n. 37421, built in 2010) may be delivered to Alrosa in February 2018. Both aircraft have been operated by WestJet since new. The preliminary leasing period is five years. Within this period Alrosa will have to pay a monthly leasing fee of $165,000 per aircraft. If the contract is extended to another three years, the monthly payments will be reduced to $150,000 per aircraft. The airline told Russian Aviation Insider that it will comment on the fleet expansion once the contract is signed and the aircraft are delivered. It is safe to assume that one of the drivers behind renovating the fleet with Western-built aircraft is the ongoing stabilization of Russia’s national currency. Reports by the national aviation regulators stating that the local air travel market has started to recover, add to the airline’s optimism. In regards to the fact that Alrosa turned down domestically-built aircraft, the spokesperson for the airline told Russian Aviation Insider last year that having studied SSJ 100 capabilities, as well as several other regional aircraft, the carrier came to the conclusion that none of them fit its requirements. “None of the aircraft in the 100-120 seat capacity flies the distances Alrosa needs. Some real specifications of the SSJ 100 (for instance, its range) differ from those promised by the presentations. We learned about it while studying the experience of other SSJ 100 operators,” he said. He also mentioned that Alrosa may return to considering the aircraft at some time in the future. Alrosa currently operated six jet aircraft – three Boeing 737-800s (with 12 in business and 144 seats in economy class), two Tupolev Tu-154s (eight seats in business and 142 in economy) and a Tu-134B (72 economy-class seats). The airline started operating Boeing 737-800s four years ago. 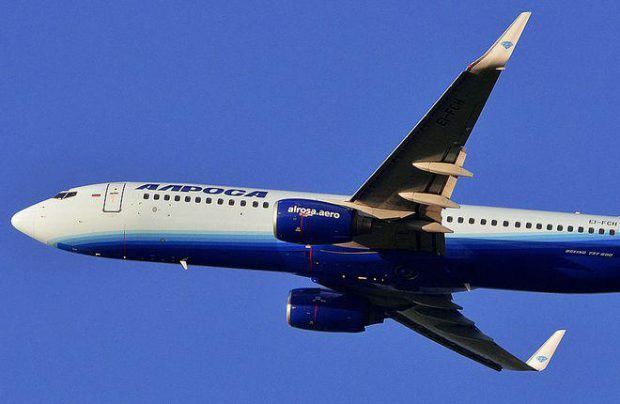 In 2013 Alrosa started flying Boeing 737-700 jointly with Yakutia Airlines, after which it leased its first Boeing 737-800. The NGs contributed to the airline’s improved operational results. Its traffic doubled from 196,000 passengers in 2013 to 421,000 in 2016. Commenting on its operation of the Soviet-built Tu-134 (built in 1980) and Tu-154s (1990 and 1992), the airline said it had no plans to phase them out this year. “The funds necessary for continued airworthiness of these aircraft have been reserved in the airline’s budget for this year. So we’ll continue operating them. Naturally, once the fleet renovation is completed, we’ll make a decision of the Tu-134 and Tu-154s, but not now,” the company’s spokesperson said. Alrosa remains the only commercial operator of Tu-154 aircraft in Russia.